Today is the official start date of our February 2018 Bang Out a Sweater knitalong: Bang Out a Carbeth. To mark this auspicious day, we are thrilled to welcome Carbeth’s designer, Kate Davies, as an MDK contributor, with the story of how this distinctive short pullover and its extraordinary photographs came together in the waning days of 2017. Join our happy band of knitters, and experience the fun of banging out a new sweater by the end of the shortest month of the year. Details about the knitalong can be found here. It began with a skirt. Which is perhaps an odd way to start knitting a sweater. I just needed something to accompany the curious, exuberant garment to which I’d decided to treat myself from my favorite store. 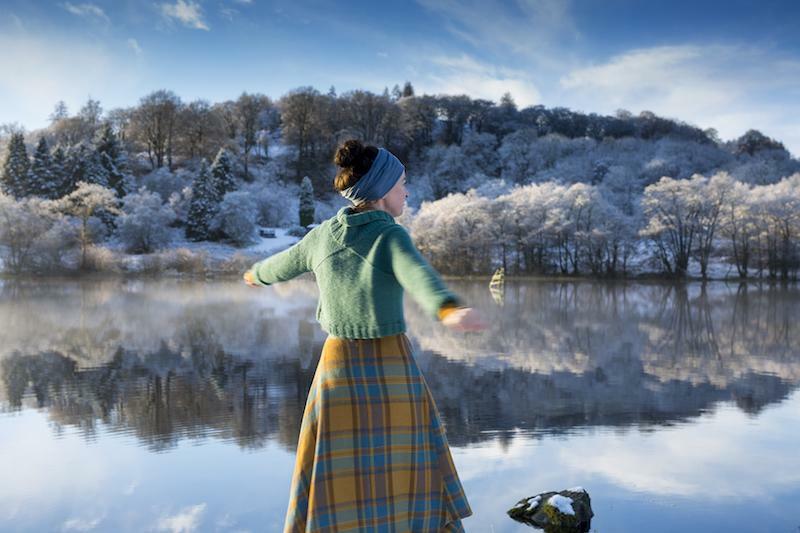 The skirt was long, high waisted, kilted: a deep mustard plaid shot through with greens and blues. I had nothing to wear with this extraordinary skirt, but I also had nothing on my needles, and whole lot of yarn in just the right rich teal-y shade. I whipped off some calculations. In my mind’s eye I saw not just the finished sweater but an entire ridiculously festive outfit. 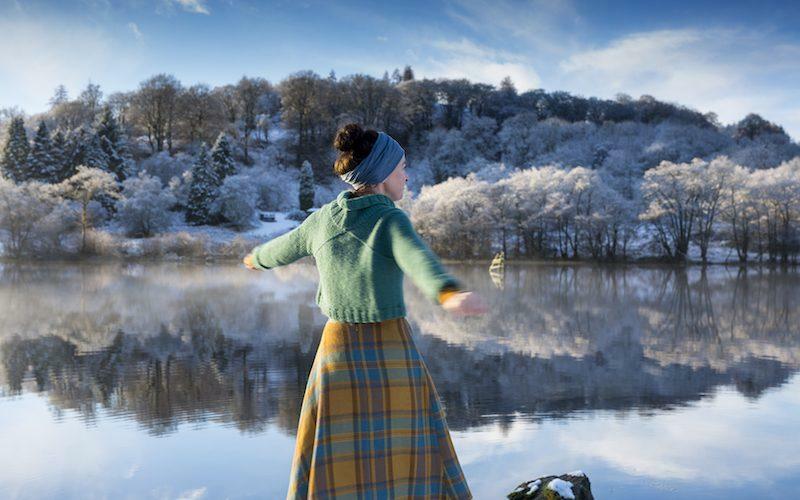 I would stride through the winter landscape in my mustard plaid, my cosy teal-hued roll-neck, my walking boots and mittens! The thick, cropped sweater would swing above the swishy kilted skirt! What a jolly seasonal silhouette! Outside the door was not the dull muddy world habitual to Scotland in December but a crazy technicolor winter wonderland. How weird to find myself swishing through the landscape in my skirt and sweater, just as I’d imagined! The trees hung heavy with snow against a bright blue sky. There was not a breath of wind, and, as the sun rose, the mist slowly began to swirl about the wee loch that sits behind our house. Tom is approximately 30% camera, and always has some photographic equipment about his person. “Shall I take a few pictures?” he asked, looking at the light, the loch. So I whipped off my coat and obligingly threw a few shapes. 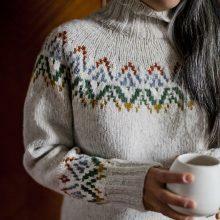 For me, sweaters rarely come out exactly as visualized. I don’t know about others who design handknits for a living, but I find the process very unpredictable. Sometimes I spend months working on a garment: swatching, swatching, knitting, spreadsheet wrangling, knitting, writing, swatching again. Sometimes this work works: I make the thing, and, in the end, the thing is good. Sometimes I push and push at an idea and, when it still doesn’t come out right, I finally have to set it to one side, or totally discard it. 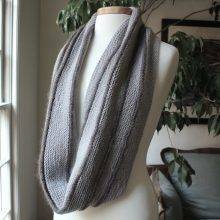 Then sometimes—very rarely—I am gripped by a whim, sit down and knit for a few days straight, and end up with a wonderful garment. This is what happened with Carbeth. Photographing sweaters is also an unpredictable affair. 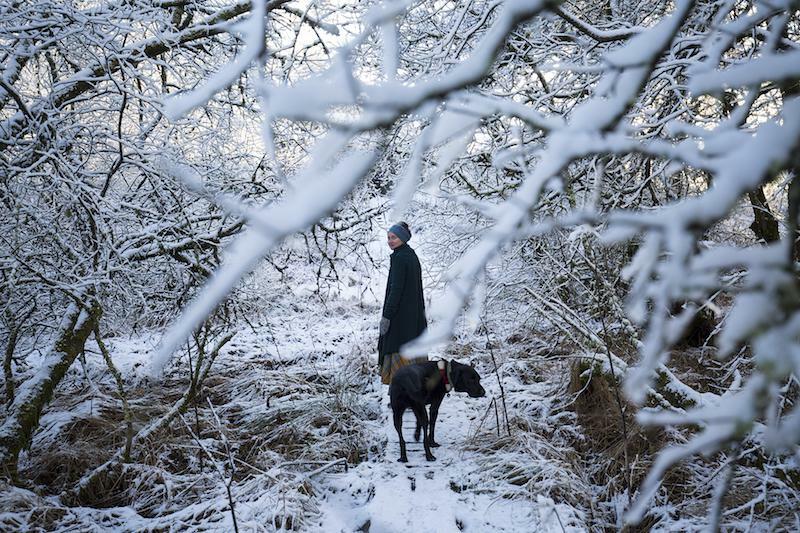 Tom and I are total country bumpkins, and the weather-beaten Scottish landscape is now part of what we do. We rarely work in a studio, and can spend weeks thinking about lighting and locations, watching the forecast, waiting for the conditions to be right. And despite all this careful forethought, I often find myself with a wind-flattened face and wild hair attempting to stare winsomely into a howling gale, before finally conceding that this photoshoot probably isn’t going to work. But sometimes, just sometimes, things turn out absolutely right. There’s no make up, no location planning, no tripod, no reflectors. I’ve not worked for weeks on the design. I’ve not considered writing a pattern, I’ve not thought about a photoshoot. 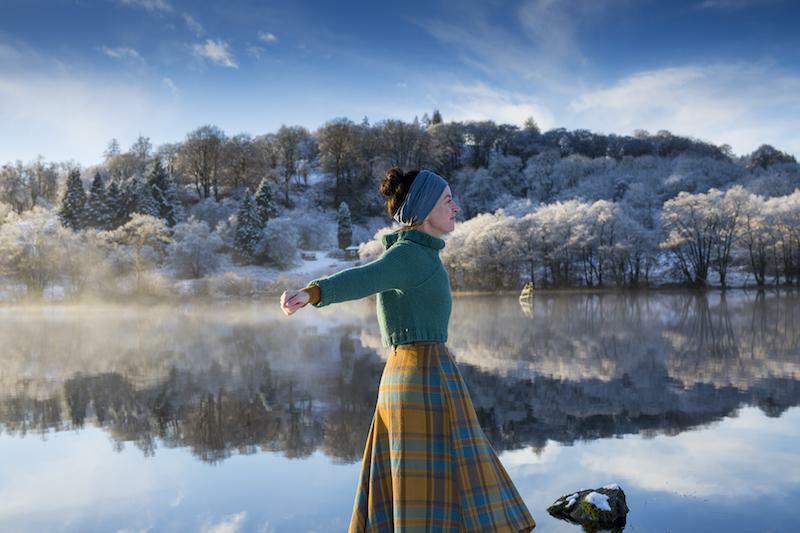 I just sat down and knit a sweater and now here I am, standing in front of a misty loch just as a swan cuts its way elegantly through the water. Here I am, in my new sweater in a landscape so magically wintry it seems to approach some sort of Douglas Sirk-like hyper-reality. Tom and I laugh and laugh about the scene’s ludicrous perfection. Sometimes these things just can’t be planned. I put my coat back on, and and we complete our walk. 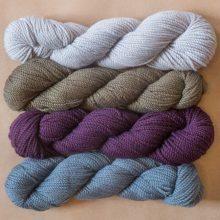 After a few more evenings of knitting: a marled version of Carbeth. I am, in general, a fan of unpredictability. I love the changeable Scottish weather: our fabled “four seasons in one day” certainly make for continual outdoor surprises. And unpredictability always keeps things interesting for me in my design process. Now that the immediate trauma associated with their creation has passed, I can chalk up that Fairisle straitjacket and those weird elephant-shaped armscyes to experience. But sometimes it can be fun for something to turn out exactly as you had pictured it. Sometimes it is nice when things work out just right. PHOTOGRAPHS BY TOM BARR, COURTESY OF KATE DAVIES DESIGNS. 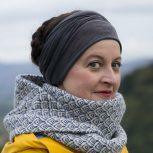 In 2010, Kate Davies left an academic career and began Kate Davies Designs (KDD), creating digital patterns for hand knitters. 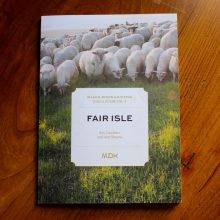 The business combined Kate’s skills in research, writing and design, and quickly became a small publishing company through which she produces her own books, bringing together her passions for historical research, textile design, and practical creativity. Kate’s forthcoming memoir, Handywoman (Spring 2018), explores her experiences of brain injury, creativity, and practices of making. Look for it this spring! Join the fun! We're banging out a sweater by the end of February. We are lucky to share in the joy of your serendipity! Thanks! But my daughter inlaw has one in her future. Huge fan of Kate’s work (written & knitted) here! So good. And such a lovely message with which to start the day. Any day, really. Thank you Ms. Davies. By the way, my husband is a Barr. Your sweater, skirt, and surroundings completely match my own fantasy of a winter wonderland. Well done! Isn’t wonderful when things just happen 🙂 They’renthe best! Now I must knit this sweater. When I first saw Kate/Tom’s photo of Carbeth on that sunny winter white lake with swan! I used it for a few days as my home page screen shot. Just to brighten a dreary gray Oregon day. A cheery Carbeth was on my needles that next day. I WILL make another! It’s still the wallpaper on my iPad. The photo was THAT spectacular! Great work Kate & Tom! This is still so exquisite, every time I look at it! I’m glad that the sweater was so easy and pleasant to plan and knit, too! This story is amazing! I love it. Would love to bang out a Carbeth but must face reality: a sweater of that length would look positively dumpy on my short-waisted, high-hipped Size 14 body. (It’s marvelous in the photos, on a narrow-bottomed body.) But I do love the top shaping. Has anyone successfully lengthened this to cover the waist and end at mid-hip? 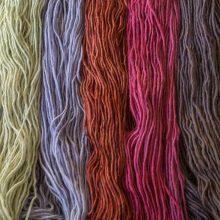 Was I dreaming when I saw a photo of this beautiful sweater knit in Brushwork, held double? I happen to have a lovely pile of Brushwork and want to do the same, but I would like to read the show notes from the person who went first. Can anyone help?